Work has begun on a new 20 Storey office building at 25 Churchill Place in Canary Wharf. Once completed in late 2014 it is set to become the new headquarters for the European Medicines Agency. The initial stages are already well under way for Canary Wharf Group and its subsidiaries. 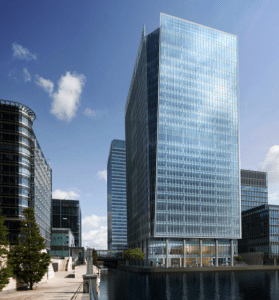 Canary Wharf Contractors Limited, has been given the contract to oversee the construction of the shell, the core, and the fit out of the property. The space will be completed to Grade A standard and the building itself will also reach the highest environmental standards with a BREEAM rating of Excellent. Allen & Overy advised European Medicines Agency (EMA) on its agreed pre-let of 250,000 sq ft of the new 500,000 sq ft office building at Churchill Place, Canary Wharf, a deal proving to be the largest letting this year in the London market in 2011. Having agreed a deal of £46.50 per sq ft, the European Medicines Agency will occupy the building’s promenade and ground floor, as well as the first nine floors; they also have an option for a further four floors – totaling 27,500 sq ft of office space. The length of the lease is 25 years and EMA will receive a 37 month rent-free period, which will be used to pay for EMA’s fit-out of the building. The European Medicines Agency is a decentralised agency of the European Union, located in London. The Agency is responsible for the scientific evaluation of medicines developed by pharmaceutical companies for use in the European Union. They are currently located at 7 Westferry Circus in Canary Wharf.